For many of us, our needs are simple: If we put something on a shelf we need it to stay there until we pick it back up again. Regardless of the shelving material or environment. Häfele America Co., one of America’s leading suppliers of furniture and decorative hardware components, hears you, lovers of durable, hearty shelving hardware solutions. To start, a mathematical thought: 3mm > 5mm. The 5mm shelf support has been around for a long time. And it works great. But Häfele’s 3mm shelf is better. The twin tooth anchoring design actually makes the German engineered and manufactured 3mm shelf supports grip more as the weight placed on the shelf increases. Available in a variety of designs for both wood and glass shelving, the 3mm shelf support system is guaranteed to provide years of trouble-free performance—something your shelves will thank you for. Also new to Häfele’s shelving options are Work Surface Brackets for fixed height shelves, countertops and desks or customized workstations. These work well in any residential or commercial location where stability and sustainability are required. 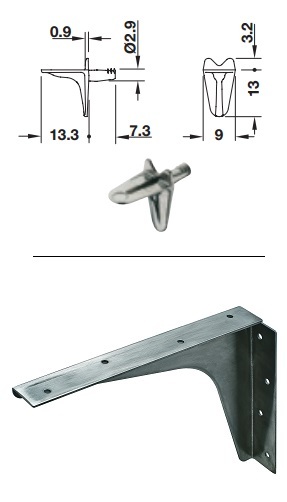 Available in eight sizes ranging from 5” x 8” to 24” x 29”, these brackets are stocked in stainless steel or powder-coated black or white and available for special order in almond or gray finishes. Weight capacities are an impressive 1,420 lbs. to 2,520 lbs. depending on the size.